van der Werf, G.R., J.T. Randerson, L. Giglio, T.T. van Leeuwen, Y. Chen, B.M. Rogers, M. Mu, M.J.E. van Marle, D.C. Morton, G.J. Collatz, R.J. Yokelson, P.S. Kasibhatla. 2017. Global fire emissions estimates during 1997-2016. Earth System Science Data. 9: 697-720. doi:10.5194/essd-9-697-2017. Andela, N., D.C. Morton, L. Giglio, Y. Chen, G. van der Werf, P.S. Kasibhatla, R.S DeFries, G.J. Collatz, S. Hantson, S. Kloster, D. Bachelet, M. Forrest, G. Lasslop, F. Li, S. Mangeon, J.R. Melton, C. Yue, and J.T. Randerson. 2017. A human-driven decline in global burned area. Science. 356: 1356–1362. doi:10.1126/science.aal4108. Chen, Y., N. Andela, L. Giglio, D.C. Morton, and J.T. Randerson. 2016. How much global burned area can be forecast on seasonal time scales using sea surface temperatures? Environmental Research Letters. 11: 045001. Jin, Y., M.L. Goulden, N. Faivre, S. Veraverbeke, F. Sun, A. Hall, M.S. Hand, S. Hook, and J.T. Randerson. 2015. Identification of two distinct fire regimes in Southern California: implications for economic impact and future change. Environmental Research Letters. 10: 094005. doi:10.1088/1748-9326/10/9/094005. Veraverbeke, S., B.M. Rogers, and J.T. Randerson. 2015. Daily burned area and carbon emissions from boreal fires in Alaska. Biogeosciences. 12: 3579-3601. doi: 10.5194/bg-12-3579-201. Rogers, B.M., G. Azzari, C.I. Czimczik, S.R. Holden, G.O. Mouteva, F. Sedano, K. K. Treseder, S. Veraverbeke, and J.T. Randerson. 2014. Quantifying fire-wide carbon emissions in interior Alaska using field measurements and Landsat imagery. Journal of Geophysical Research – Biogeosciences. 119: 1608-1629. doi: 10.1002/2014JG002657. Veraverbeke, S., F. Sedano, S.J. Hook, J.T. Randerson, Y. Jin, and B.M. Rogers. 2014. Mapping the daily progression of large wildland fires using MODIS active fire data. International Journal of Wildland Fire.23: 655-667. doi: 10.1071/WF13015. Sedano, F.A. and J.T. Randerson. 2014. Multi-scale influence of vapor pressure deficit on fire ignition and spread in boreal forest ecosystems. Biogeosciences. 11: 3739–3755. doi: 10.5194/bg-11-3739-2014. Randerson, J.T., Y. Chen, G.R. van der Werf, B.M. Rogers, and D.C. Morton. 2012. 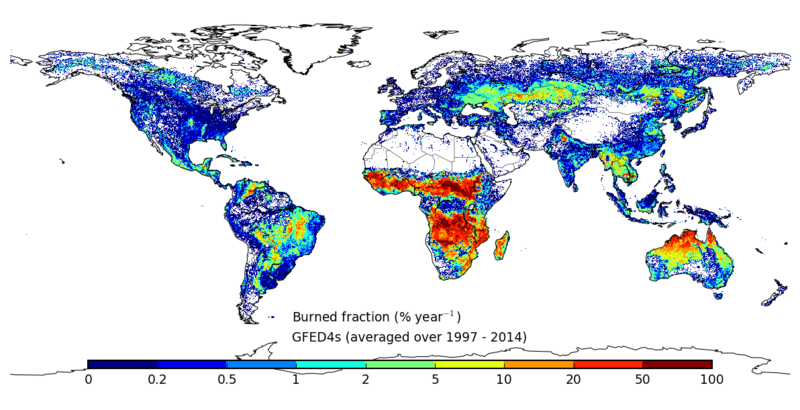 Global burned area and biomass burning emissions from small fires. Journal of Geophysical Research – Biogeosciences. 117: G04012. doi:10.1029/2012JG002128.